I always wanted to try BBlunt products whenever I spotted them in Westside or New U. My hair being frizzy almost 360 days in a year ( counting 5 good hair days! ), I was more than happy to try this product. BBlunt products are especially created for Indian hair type and weather conditions. Here is my take on this product. This versatile cream ensures your hair looks great, however hot, dry or humid it gets out there. It enhances natural movement, smoothens and leaves you in charge, whatever the weather. Protects from the environment and heat styling damage. BBlunt Climate control Anti frizz cream comes in an opaque, black shaped plastic bottle with a pump dispenser. There is a rotating on-off mode on the pump dispenser, so there is no unwanted spillage. The bottle is sturdy and travel friendly. The cream is white in color with creamy consistency. It is neither too liquid nor too thick, just enough creamy to spread properly. The fragrance is amazing but it doesn’t last long. It lingers for about half an hour on my hair. I use a coin sized amount (2 pumps) for my mid waist length hair. I apply the cream on damp, towel dried hair. Upon drying, it makes my hair really smooth and reduces frizz for most of the day. It is also easier to detangle and comb the hair after using this product. It makes my hair look sleek and manageable. This cream doesn’t weigh down the hair but if you apply too much of the product, it will make the hair feel heavy and oily. The anti frizz effect stays for 4-5 hours, so if you apply this product in morning, your hair will not remain frizz free by night. 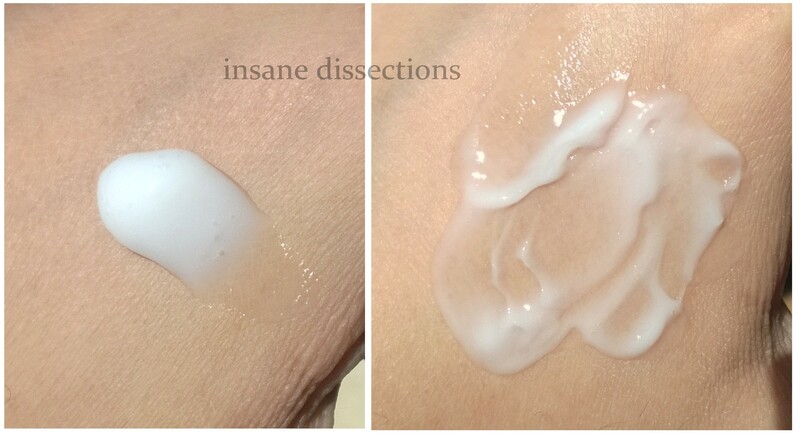 As the effect lasts for less than a day, the product needs to be applied again the next morning. I use the product on dry hair as well, using lesser quantity and applying mainly on fly-aways and the ends. The product claims to be heat protective, but somehow I couldn’t bring myself to using this alone without my heat protecting lotion before straightening/ styling my hair. But the heat protecting feature is always an added benefit! Overall, this product makes the hair sleek, smooth, manageable and frizz free for 4-5 hours. It doesn’t make the hair greasy if applied in moderate quantity. It also helps in detangling the hair. The fragrance is amazing but it doesn’t last long. I wish the anti-frizz effect lasted longer. This product is available in a smaller packaging as well, so one can try that before buying the bigger bottle. *Disclaimer: Product sent by brand for review. 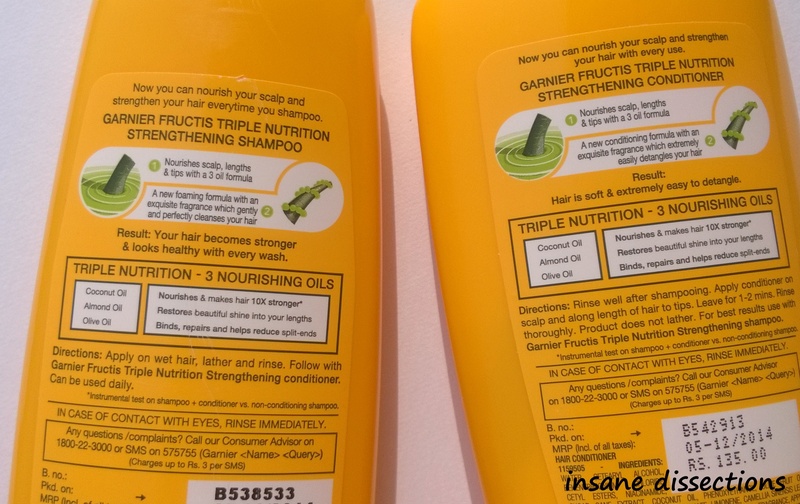 After reviewing the shampoo and conditioner from the Garnier Fructis Triple Nutrition range (check review HERE), I am reviewing another great product from the same range of Garnier. 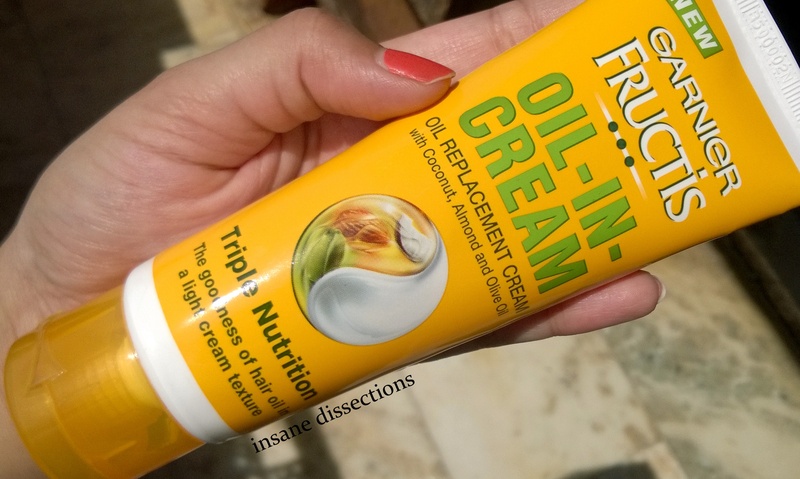 Garnier Fructis Oil-in-cream is supposed to be a new generation hair oil, containing the benefits of three oils- coconut, almond and olive oil. A nourishing hair oil in a light creamy texture. 0% sticky, this light texture cream gets absorbed quickly. Easy to use without messiness of hair oils which includes sticky hair, greasy hair, staining and smell. 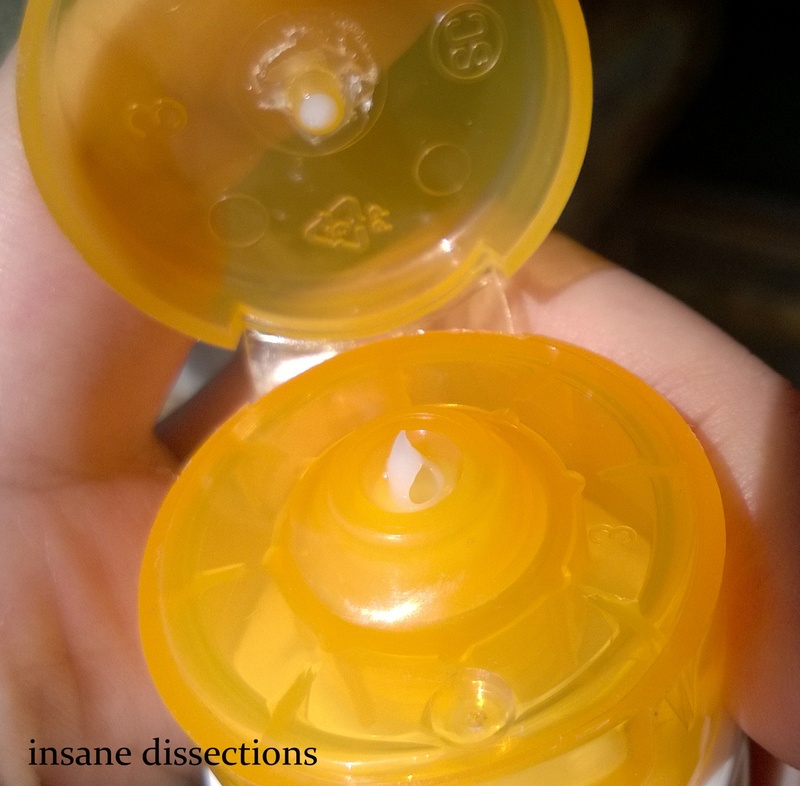 This product comes in a squeeze tube packaging with flip open cap. The cap is sturdy, leak proof and travel friendly. The yellow color of the tube is signature of its Triple Nutrition range. The fragrance of this cream is strong and fruity which lingers for a day or two, depending on whether you use this product before or after hair wash. The consistency of this oil-in-cream is really creamy. It is milky white in color, similar to the conditioner of this range. I have used this product two ways- pre hair wash as hair oil and after hair wash as leave in conditioner. Pre Hair wash: If you use it as a replacement for hair oil, dollops of this cream will be used depending on your hair length. 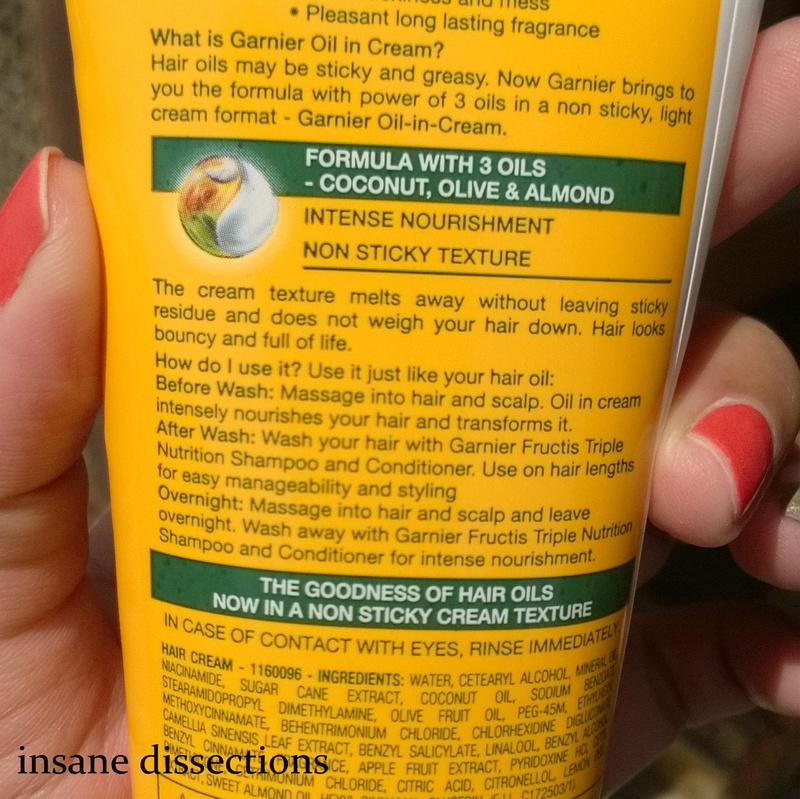 This cream does not leave the hair sticky or greasy at all. My hands were not greasy after the application either. But it does leave the hair looking like one has applied gel, minus the hardness/crunchiness. It leaves the hair really soft and smooth after the hair wash. You can apply this cream just before you wash your hair, or overnight. I wouldn’t say this product can replace hair oil altogether, because in addition to smooth hair that the hair oils promise, massaging of scalp with the oil is equally important in my opinion. And if you attempt to massage with this cream, I am sure the whole tube will get used up in one application only. Plus it is loaded with chemicals which normal hair oils are not, so deep nourishment is out of question. Post Hair wash: I used a coin sized quantity for application on damp hair just after washing. It did make my hair smooth and really soft to touch. It controls frizziness to an extent. It however did not help in detangling of hair at all. But then this is not a serum and does not claim it either. This product shows its magic only after the hair has dried! Overall, this is a really great innovation for women on the go. It does make the hair really really soft and smooth. I wouldn’t say this product can replace hair oil altogether, but it is a wonderful product on its own, especially on days you don’t have time for a good oil massage. It is easy on pocket, has amazing fragrance and live upto its claims. I would definitely recommend it. *Disclaimer: Product sent by brand for review. Honest opinion. 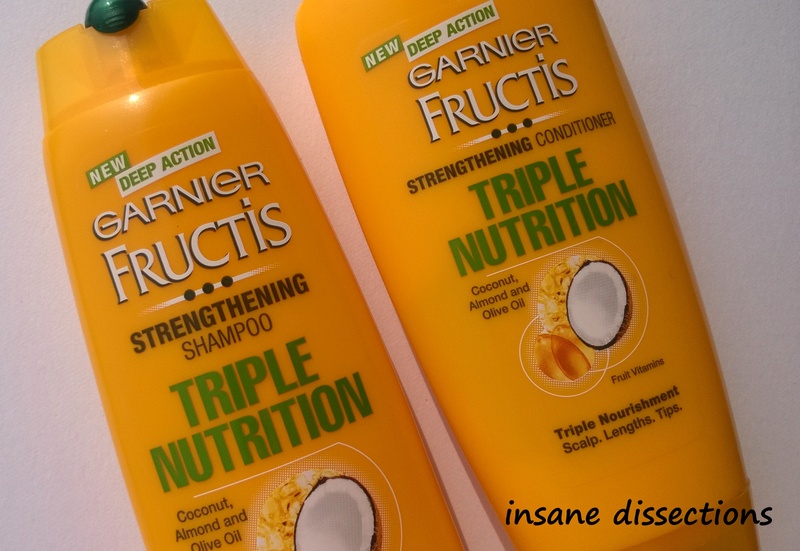 I am reviewing the Garnier Triple Nutrition range after using the shampoo and conditioner duo for one month. Before coming to the review, here is something about my hair. My hair are thin, wavy, frizz prone and very dry these days. Because of dryness, my hair tangles easily hence leading to breakage. Nourishes scalp, length and tips with a 3 oil formula. A new foaming formula with an exquisite fragrance gently and perfectly cleanses the hair. Garnier Fructis Triple Nutrition shampoo comes in a bright yellow packaging with flip open button cap. The cap is sturdy which shuts tight making it spill proof and travel friendly. But since the packaging is opaque, the quantity of product left in bottle can not be seen. The shampoo is pearly white in color. It is runny in consisitency but lathers well. The first time I washed my hair using this shampoo, I saw an increase in hairfall while washing. But second wash onwards it got normal. This shampoo makes hair squeaky clean but somehow I felt it made my hair dry. Or maybe it’s because of cold weather, but due to this dryness my hair have been tangling a lot leading to major hairfall. The fragrance of this shampoo is strong and fruity, and lingers for a few days. 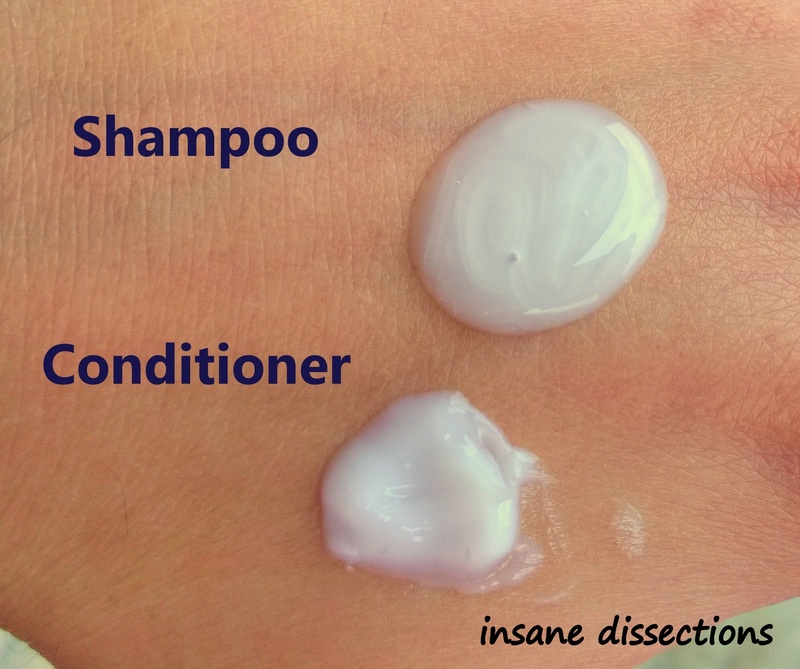 The conditioner comes in the same packaging as the shampoo except that the nozzle for dispensing product is at the bottom. The conditioner is milky white in color and very creamy in texture. It is actually more creamy than most other conditioners in market. Being so creamy, it spreads easily through the hair and makes the hair soft and manageable. It leaves the hair feeling smooth and hydrated. The fragrance is similar to the shampoo. It takes care of dry ends and adds shine to the hair without weighing the hair down. I still however need a serum since the shampoo makes my hair very dry. I have used the conditioner with other shampoo and it does its job really well. I have no complaints with the conditioner. Love it! 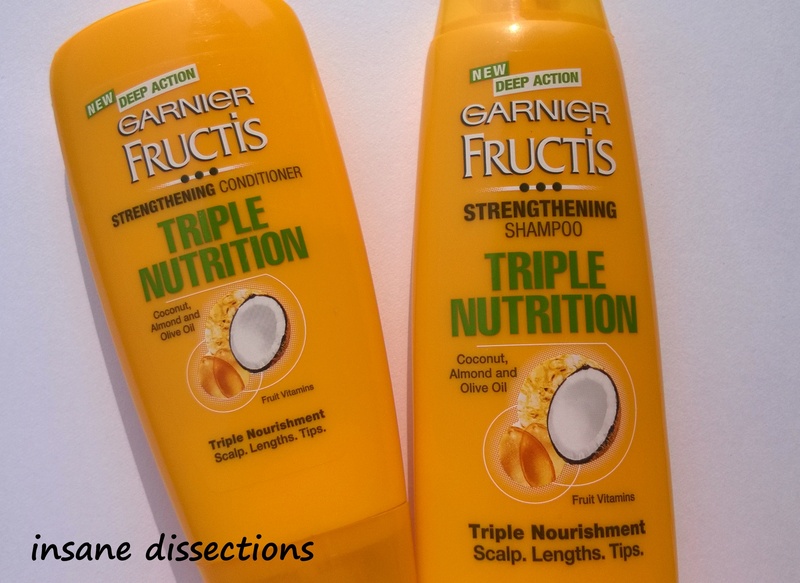 Overall, Garnier Fructis Triple Nutrition shampoo and conditioner when used together is great for someone who does not have extremely dry hair. The shampoo cleans the hair and takes off the oil effectively. The conditioner is super creamy and spreads easily. It makes hair smooth and hydrated. Plus they smell nice and are so affordable. The shampoo could have been more hydrating though. 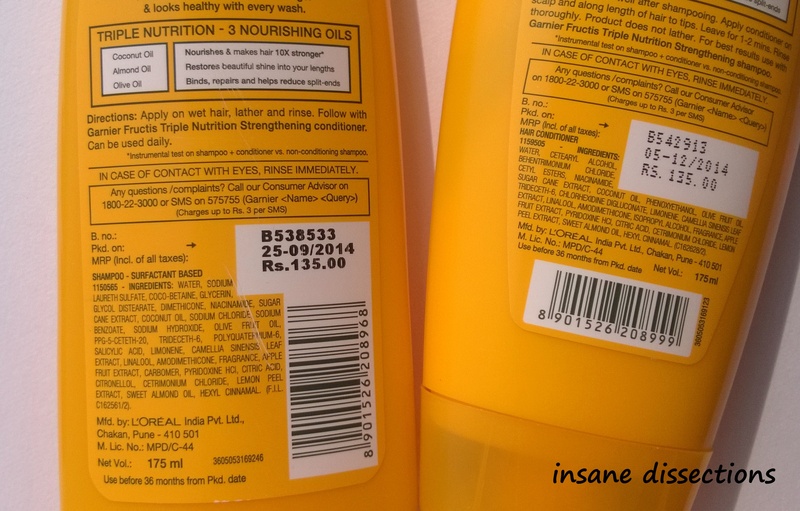 *Disclaimer: Products sent by brand as part of Happy Hair Challenge. I have wavy to straight, brown hair. I stay away from chemical treatments. My hair are thin, silky but lacks volume. However my major concern is frizziness these days. Hairfall not a major problem, but still present. I have almost-waist length hair. And whenever I want a quick fix to my unmanageable hair, I straighten them with hair straightener. So the deal is, I never stick to one shampoo and conditioner. I keep on changing it. As I said, I am not too fussy about my hair. 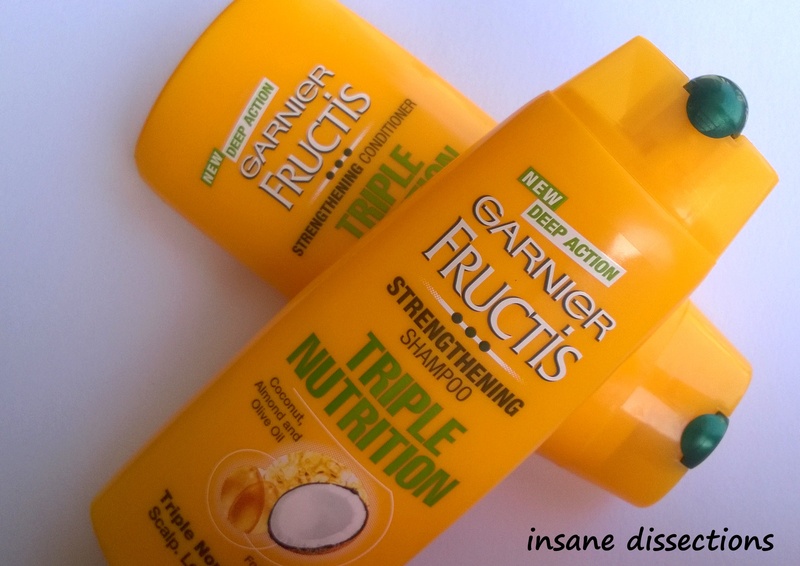 This time I am trying Garnier Fructis Triple Nutrition range. I remember using Garnier Fructis range when I was in school. It used to come in green packaging and had a very fruity fragrance. This shampoo and conditioner combo promises to strengthen and provide nutrition to hair. The range is enriched with the goodness of 3 oils-Coconut, Almond & Olive, each are well known for their hair care properties. Garnier Fructis Triple Nutrition shampoo and conditioner come in a bright yellow plastic packaging with flip open button cap. The cap shuts tight making it spill-proof and travel friendly. However, because the packaging is opaque, the quantity of product left in bottle can not be seen. The fragrance is strong and fruity-floral. The shampoo is pearly white in color and consistency is slightly runny. The conditioner is milky white in color and very creamy in texture. It is actually more creamy than most other conditioners in market. Garnier Fructis Triple Nutrition shampoo and conditioner are available at departmental stores and medical shops across the country.